The Hammond Museum of Radio hosts one of the largest operational collection of Collins Radio equipment anywhere. With Collins building less than 100 of its 30K stations, this fully operational Collins 30K is a rare find. Kept in pristine condition, the station frequently takes to the air with the same bold signal it produced the day it left the Collins factory. The 30K featured a 4-125 modulated with a pair of EIMAC 75T's to produce a comfortable half Kilowatt. If you look close, you can see the glow from the 4-125 just below the center of the three tuning controls. The museum features the ultimate in stations for AM operation on 80 and 160 metres. 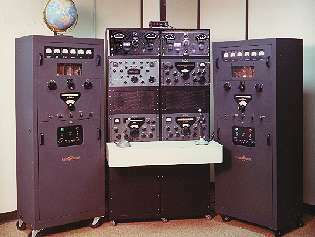 The largest Collins station features a pair of Collins KW-1 Transmitters Serial #59 and 147 each operating with it's own matching 75A4 Receivers. The top rack unit contains the modulation indicators for each station all of which are in perfect working condition. 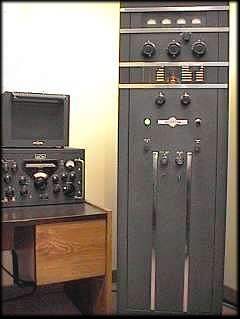 The KW-1 transmitters loaf along at the legal limit with a pair of 4-400A tubes. While Collins originally shipped these stations with 4-250A's, most operators upgraded the finals to the 4-400A's for improved performance and output. The Museum also features this fully restored and operational KWS1 station. On the more modern front, visitors can view beautifully restored KWM1 and KWM2 (see adjacent photo) stations complete with all optional accessories.